I was curious about the state of the photoblog industry recently, and was interested to find out what kind of people still post on an active basis on their blogs. Some of my favorite photobloggers over the years are still publishing (albeit very infrequently), while others have quit photoblogging altogether (yours truly included). Peak number of entries to the Photo Friday contest occurred between 2004 and 2006, when an average of more than six hundred entries were submitted on a consistent weekly basis. 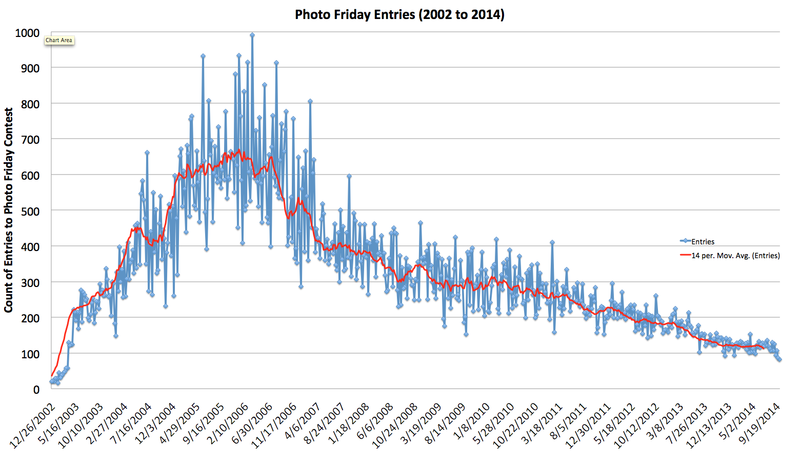 The number of entries to Photo Friday contest has been on a gradual decline since late 2008, with no rebound in sight. There has not been a single week in 2014 in which more than 200 entries were submitted to the Photo Friday contest. By contrast, there was not a single week from February 2004 until April 2009 where fewer than 200 entries were submitted to the Photo Friday challenge. If an extrapolation can be made, the last year in which more than 100 entries would have been submitted to the Photo Friday contest would be in 2014. One of my other, biased proxies regarding the state of the photoblogs? When one of the best photoblog out there, Daily Dose of Imagery, decided to call it quits on July 4, 2013—after ten years of daily photoblogging. The gimmick appears to be an attempt to maximize profits from Russia’s mortgage lending boom as people watch their savings lose value amid a sliding ruble and rising interest rates. The whole reason for the gimmick? Capitalizing on the superstition that maintains that it is good luck if a cat is the first to enter a new home.